Kyle Rayner is caged, both physically and spiritually. The Green Lantern of the ’90s is a prisoner of an intergalactic gang of rebels in The Omega Men, a 12-issue miniseries reimagining Marv Wolfman and Joe Staton’s titular cosmic superhero team in a heavily politicized modern context. This new status quo has given writer Tom King the opportunity to delve deep into the existential despair of a character who randomly stumbled upon the superhero lifestyle and suffered a deep, traumatizing tragedy because of it. This week’s The Omega Men #4 shines a spotlight on Kyle’s pain as he forms a connection with his fellow inmate Kalista, opening his heart to her by detailing the path that led to his imprisonment. His story provides much-needed exposition to serve character development, making the issue a heartbreaking exploration of one man’s overwhelming vulnerability. This insightful effort also accelerates the plot and further establishes the war-torn cosmic landscape of the series. Toby Cypress steps in for regular artist Barnaby Bagenda for this issue, and it’s a brilliant decision by editors Brian Cunningham and Andy Khouri, who hired Cypress to create stunning Kyle-centric variant covers for the first three issues. Cypress’ loose, fluid style is a stark departure from the crisp detail of Bagenda’s work, but it’s an excellent fit for a story about a character desperately trying to break free from his restraints. The energy in Cypress’ expressionistic linework and composition creates a feeling of liberation that reflects Kyle and Kalista’s desire to escape their circumstances, accentuated by most of this issue’s artwork deviating from the nine-panel grid structure of the first three issues. The first and last pages stick to the established panel layout to serve as transition points in and out of the main action, which rattles the grid before breaking from it completely. The gutters of the nine-panel grid are the bars of a jail cell, but they begin to dissolve as Kyle starts talking to Kalista, creating a personal relationship that offers him momentary solace from his imprisonment. Having a cellmate is a change in Kyle’s routine, and the layout shifts as they form a connection. When Kyle recounts how he became a Green Lantern, the panel borders disappear completely, clearing the slate for a brand new panel structure in the following pages. That splash page of sequential moments bleeding into each other establishes an atmosphere of openness as the past Kyle discovers the wonderful release that comes with the power of the Green Lantern ring. The series of circles on the page reinforces the script’s idea that receiving all that power was “nothing more than a flip of the coin.” Kyle’s fate is contained in that little green ring, and Cypress gives the alien object extra importance by making the largest element in the splash the image of Kyle holding the ring between his fingers. The following page reintroduces panel borders, but the layout is now widescreen, which serves a dual purpose. It highlights Kyle’s spectacular change in perspective after stepping into a superhero role, but it also evokes the sensation of falling, with the widescreen horizontal panels serving as steps in Kyle’s descent into darkness. To get that latter point across, Cypress ends the first widescreen layout with a panel showing Kyle as White Lantern floating above different versions of himself tapped into the various colors of the Lantern spectrum, with each of those individual Kyles contained in a triangular panel that points downward. It’s a starburst of power, but the layout of the gutters and how they bleeding into the preceding panel brings a descending motion to the page, foreshadowing the tragedy to come when Kalista asks Kyle what happened to his girlfriend. That downward motion is immediately followed by a page showing the Sinestro Corps—the Lantern Corps dedicated to inspiring great fear in others—and Kyle holding his dead girlfriend, Alexandra DeWitt, who was infamously murdered and stuffed in a refrigerator. The superhero high is exciting while it lasts, but ultimately it’s not worth the devastating crash. Alexandra is never named in the script; she’s always referred to as “the girl,” indicating the distance Kyle puts between himself and the memory of his past love. The fate of Alexandra is so dreadful that it inspired Gail Simone to create Women In Refrigerators in the late ’90s, a website dedicated to the sad trend of horrible things happening to female characters as a way of motivating male heroes. King doesn’t shy away from the permanent damage Alexandra’s gruesome death has done to Kyle’s emotional well-being. Much of this issue concerns the inescapable cycle of fear he’s been caught in since Alexandra’s death, because unlike the other Green Lanterns, Kyle wasn’t chosen for his ability to overcome that specific negative emotion. In that time of desperate need, the Guardians reached out to the first person who would help them, who just so happened to be Kyle; he doesn’t have the same emotional fortitude as the rest of the Corps. Kyle is vulnerable, and King’s focus on those weak points has given the character a riveting internal obstacle to overcome in this series. In order to give Alexandra’s death meaning, Kyle has committed himself to saving as many people as possible, but he has limits to his power. The realization that he can’t save everyone is the ongoing reason for Kyle’s fear, and being forced to watch the slaughter of 4,000 people by the Citadel has made him acutely aware of the futility of his life goal. He’s helpless without his ring, and each day he spends in his cell intensifies his guilt and feeds his fear. King formerly worked for the C.I.A.’s counterterrorism unit, and that experience has brought a political edge to his superhero-comics writing. Grayson may take place on Earth, but The Omega Men is where King addresses issues like the U.S. military’s occupation of the Middle East, the relationship between social unrest and religious fundamentalism, and the hazy distinction between terrorists and freedom fighters. 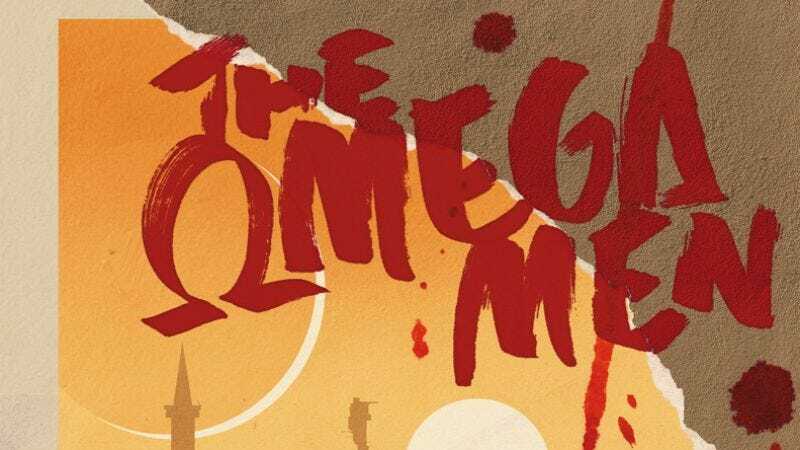 Examining these ideas in the context of a cosmic superhero narrative brings a lot of depth and complexity to The Omega Men’s mission, and Kalista’s backstory provides most of the political punch in this week’s issue. The Vega System is a cosmic version of the Middle East, an environment made up of different planets engaged in long-standing conflict because of divergent religious ideologies and militarized expansion into territories already occupied by a native population. Kyle can be viewed as the United States, an outside party pushed into a situation that he doesn’t fully comprehend and isn’t adequately prepared to face. The day Alexandra died gave Kyle a hero complex that forces him to act without considering the future consequences. Now he’s stuck in foreign territory, surrounded by people who want to use his power to further their own agendas. Kalista is one of those people, and every day since she was a child, she has been forced to murder a native to keep her planet’s balance of power firmly in favor of her alien race, The Brahmins. She’s also the leader of The Omega Men, pretending to be a captive like Kyle as part of a plot to sway him to their side of the fight. Kalista puts on a damsel-in-distress mask after hearing Kyle talk about his compulsive need to save others, giving him something to fight for in a seemingly hopeless situation. The dramatic irony creates a lot of tension in Kyle and Kalista’s interactions. Kalista is such a good performer that she’s able to make the reader empathize with her struggle as she recounts the painful details of her own past and the injustices that motivated her to lead a rebel movement. Complex and in complete control, Kalista is King’s deliberate attempt to create a female character wholly unlike Kyle’s tragic ex-girlfriend, and she’s a fascinating co-lead for this title. Cypress cleverly captures Kalista’s put-upon submission by using traditional romance comic compositions for the closing pages, putting Kalista in positions where she’s burying her head into Kyle’s chest or looking up at him longingly. Romulo Fajardo Jr.’s coloring makes Kyle a source of heat by contrasting his warmer skin tone with the chilly paleness of Kalista’s flesh, and there’s a specific moment where that warm shade becomes an important storytelling tool. For two panels in the middle of Kyle and Kalista’s embrace, the background changes from a cool bluish gray to an earthy orange, underlining the importance of Kalista whispering to Kyle that she’s sorry. In that moment, she’s expressing the tinge of regret she feels for using Kyle when she knows how damaged he is. Then the background changes back to bluish gray and the remorse disappears, replaced by the mission at hand. After all, Kyle isn’t a person to The Omega Men; he’s a weapon. Kalista’s lover and teammate Primus refers to Kyle as “The Bomb,” dehumanizing him as a way of justifying the despicable act of capturing him, sewing an explosive into his neck, and psychologically manipulating him so he’ll fight on their side. There are legitimate reasons for The Omega Men’s crusade and Kyle’s power would be a huge boon for them, but their course of action to gain that power makes it difficult to side with them. These rebels view Kyle as a means to an end while the creative team views him as a multifaceted person. The tension created by intertwining these two different perspectives makes The Omega Men a gripping new take on these cosmic characters.